Biomass being transported in a turbulent flow of sand. Heat transfer at the particle surface, wakes shed by particles, and catalytic reactions give rise to coherent structures in the form of dense clusters and particle-free voids that can augment or restrict conversion efficiency. The grant, NSF award #1846054, is for approximately $500,000 over five years. The project uses the Flux computing cluster operated by Advanced Research Computing – Technology Services (ARC-TS), for simulations, modeling, and machine learning. Abstract: Multiphase reactors are central to nearly all energy processes. Examples include the production of biofuels, post-combustion carbon capture, and particle-based solar receivers. In addition, many natural processes involve multiphase heat and mass transfer in a turbulent flow. For example, ocean spray ejected from breaking waves affects air-sea fluxes that influence the intensity of hurricanes. 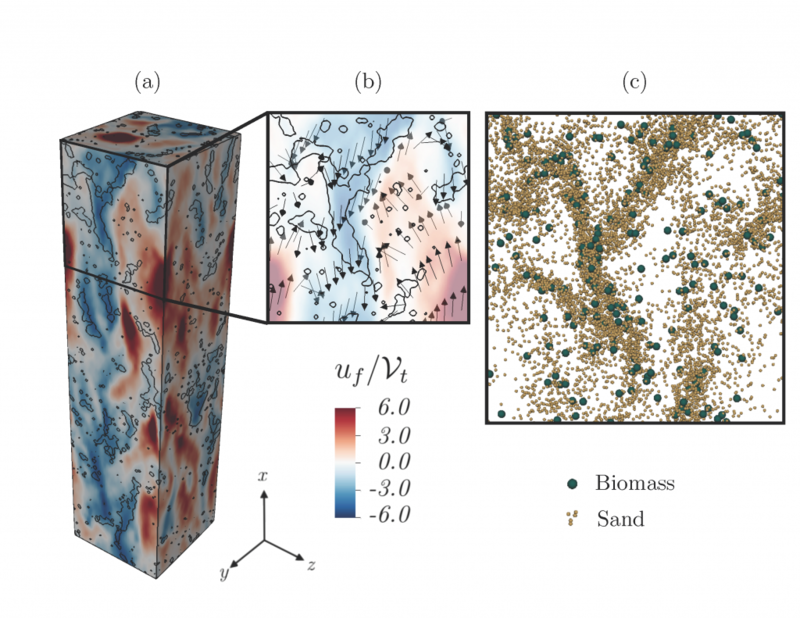 However, there are many challenges associated with modeling how turbulent mixing interacts with the reaction kinetics, mass transfer, and heat transfer across length and time scales. Because of these challenges, most existing models are based on empirical correlations that do a poor job at predicting measurements in applications of interest. This project aims to improve our fundamental understanding of these complex multiphase flows and enable predictive models that work across varying regimes. The Principal Investigator will use his expertise in multiphase flows and turbulence modeling to accomplish three goals. He will 1) establish a connection between two-phase flow dynamics and rates of heat and mass transfer, 2) use recent advances in data science and machine learning to link physical processes across scales, and 3) create a museum exhibit that highlights the art and science of these complex flows and its role in the energy sector. While there has been significant progress characterizing hydrodynamic interactions in particle-laden flows, much less is known about interphase heat and mass transfer. State-of-the-art codes used in industry and academia rely on simplistic models for average reaction rates as well as heat and mass transfer coefficients that are known to vary by orders of magnitude across two-phase flow regimes, resulting in enormous predictive uncertainty. The main limitation is the lack of meaningful data that describe multiphase interactions from the level of individual particles to larger scales of interest. In this project, unique, high fidelity numerical simulations will isolate two-way coupling between the phases and establish a relationship between multiphase interactions and heat/mass transfer. The emergence of inverse modeling and machine learning has enabled new approaches to systemically inform models with such data, and will be used here to quantify and reduce model uncertainty. The combination of these efforts will result in a new paradigm in data-driven multiphase turbulence modeling. Results are anticipated to have far-reaching impact on energy and environmental applications.